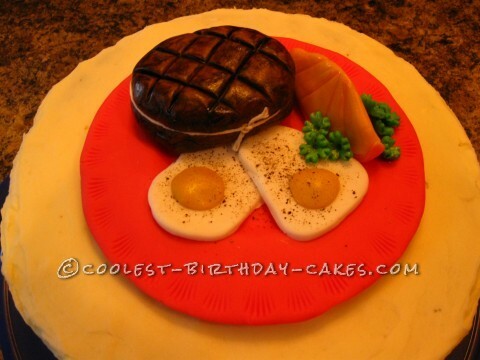 This Steak and Eggs cake was made for a comedic co-worker who was always asking for someone to bring him steak and eggs for breakfast. I warned him…some day I would! This chocolate cake was covered with marscapone frosting and then I placed a fondant plate on top. The steak was formed out of fondant and I made grill indents on the top. I brushed in some dark brown coloring jell and then brushed it with a thinned brown jell (I use a bit of vodka) so it looked like it was freshly cooked. I tied it with butchers string to make it look authentic. I formed the eggs and garnish out of fondant and placed them on the plate using edible glue. I sprinkled the eggs with real pepper and added a bit of white glitter to the orange. His face was priceless when he saw it. Wonder what he will ask for next?